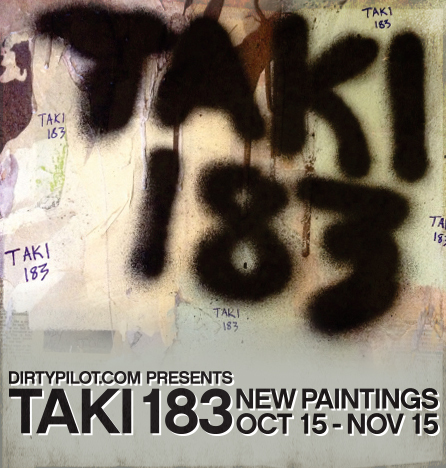 Now showing new paintings by TAKI 183. As one of the most influential Graffiti writers in its history. His “tag” was short for Demetaki, a Greek alternative for his birth-name Demetrius, and the number 183 came from his address on 183rd Street in Washington Heights He worked as a foot messenger in New York City and would write his Nickname around the streets of New York City that he frequented during the late 1960s and early 1970s. On July 21, 1971, The New York Times ran an article about him on the front page of its inside section, titled “Taki 183″ Spawns Pen Pals. TAKI 183 spurred competitive vandalism in NYC as his tag was mimicked by hundreds of youth across the five boroughs. The kids who got their names up the most and who developed signature tags, became known in their communities. Graffiti became a way for many young kids to try to get attention and the attention TAKI 183 received spurred this on. Although TAKI 183 was the first to be showcased in a publication it is said that Julio 204 began writing his tag in NYC first. However Julio did not write outside his own neighborhood and this is arguably the reason why he never received the media-attention TAKI did. TAKI was last known to be the owner of a foreign car repair shop. In an interview with the New York Daily News of April 9, 1989, he talked about his retirement as a graffiti vandal: “As soon as I got into something more productive in my life, I stopped. Eventually I got into business, got married, bought a house, had a kid. Didn’t buy a station wagon, but I grew up, you could say that.” The graffiti tag in the 1985 film Turk 182 was inspired by TAKI 183.